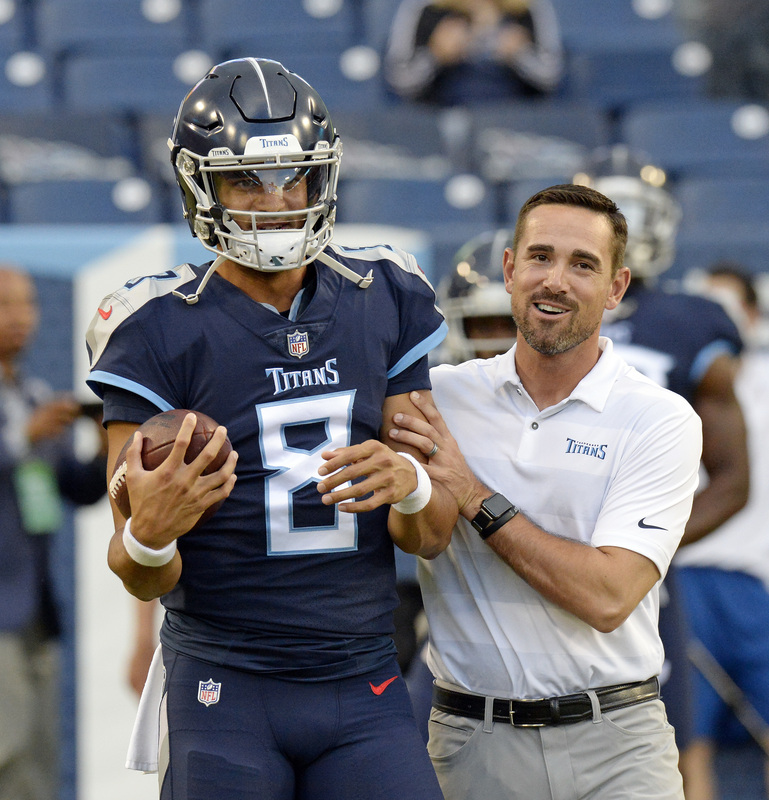 Tennessee Titans quarterback Marcus Mariota and new offensive coordinator Matt LaFleur in happier times, presumably before Mariota was sacked 11 times last week by the Ravens. What if Mike Mularkey was right? Despite back-to-back 9-7 seasons and a playoff win in Kansas City, most Titans fans – and management, too, for that matter – never fully bought into Mularkey and offensive coordinator Terry Robiskie’s “exotic smashmouth” style that produced a less-than-exciting brand of football. When the Titans brought in Mike Vrabel to be the new head coach, and he in turn hired Matt LaFleur, fresh from the high-powered Los Angeles Rams, as offensive coordinator, it was universally hailed as a move that would finally push the Titans offense into the 21st century. Gone would be the three yards and a cloud of dust days when the Titans would scratch and claw and hopefully come out on the winning end of a 16-13 score. After all, Titans fans had seen enough of that going all the way back to Jeff Fisher’s days as head coach. But six weeks in – save for two good quarters and overtime in the win against Philadelphia – LaFleur’s offense is stuck in neutral, even while other NFL teams are scoring at record levels. In three of the first six games, the Titans have failed to score a touchdown. And in two different stretches thus far, the Titans have gone seven quarters without a touchdown and enter Sunday’s game in London against the Chargers riding an eight-quarter streak without finding the end zone. “Every game is different,” LaFleur explains. “As soon as one game ends, you’ve got to look at the film, correct it, see what you can improve upon, and then that game is out of mind. “I definitely know we’ve got to do a better job in the red zone. It starts with me putting together a good plan for these guys to go out and execute. Not all the Titans offensive mess lies with LaFleur, but as the offensive coordinator, the buck for the offense’s failures stops with him and Vrabel – just as it did for Robiskie and Mularkey the past couple of years. With LaFleur’s background, the Titans probably assumed they could copy and paste a version of the Rams’ scheme, tailor it to quarterback Marcus Mariota’s skillset and light up the scoreboard. But such a radical change to the offense was probably too much too soon. The more you look back now at what Mularkey and the Titans did, and compare it to what isn’t working now, you see that maybe Mularkey’s staff won games really the only way the Titans were capable of winning. They pounded the ball with DeMarco Murray and Derrick Henry to shorten games against more explosive offenses. They relied on the pass catching of Delanie Walker down the middle and sprinkled in a few heroics here and there from Mariota’s legs and right arm. Yes, there were times Mularkey’s system was boring, times when it was ugly and times when the criticism of it was absolutely justified. But more often than not, it worked, producing 19 wins in two years. The other part of where the Titans are now, and perhaps why the offense is drowning in a new system, is the decision not to significantly upgrade the offensive personnel that would run LaFleur’s more wide-open scheme. Other than basically swapping Murray for Dion Lewis, the offensive personnel is virtually the same as the past two years. There seem to be many square pegs not fitting into the round holes of the new scheme. Now, without an injured Walker, the shortcomings are magnified. Through a six-game sample size, the numbers show the current cast of characters is simply not productive enough or explosive enough to consistently execute what LaFleur is calling. Mularkey and his staff knew that, too, and in hindsight it appears “exotic smashmouth” was a way to hide many of the Titans’ offensive shortcomings. That’s a lesson the current staff seemed to apply early in the season when the team was at less than full strength in wins against Houston and Jacksonville. But no matter how much they might wish to open things up, for now, maybe they need to take a page from Mularkey’s book and instead cover some things up.